Happy Friday...hope you had a lovely week. 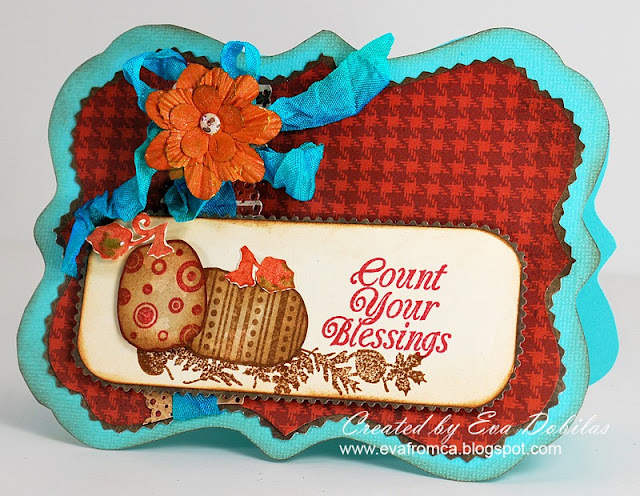 I am going to be very short on my post today, but I wanted to share with you a happy Thanksgiving card I made with Samantha Walker's Fall Family Memories Unity Stamp set. I also used Samantha Walker's Creative Imaginations papers on this project and what do you think of that pretty blue crinkled ribbon???? Well, it is new to my collection and I made it with Luminarte's Radiant Rain Shimmering Mist (Teal Zircon) and my Prima flower was misted with their Autumn Leaf mist. Aren't they pretty. Also my card shape is another Samantha Walker Silhouette cut called Artisian Nesting Rectangular...love this shape so much!!! The sketch of this card was based on this week's Mojo Monday sketch, which I loved! Well, that is it for today. Hope you enjoyed the hop today and have a FABULOUS Friday!